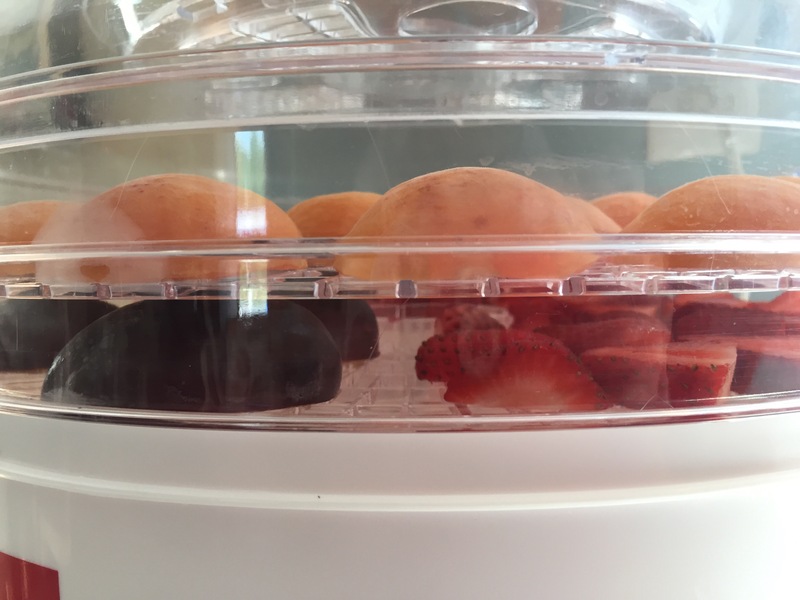 I was so excited when I found a small dehydrator at Goodwill for just $14! 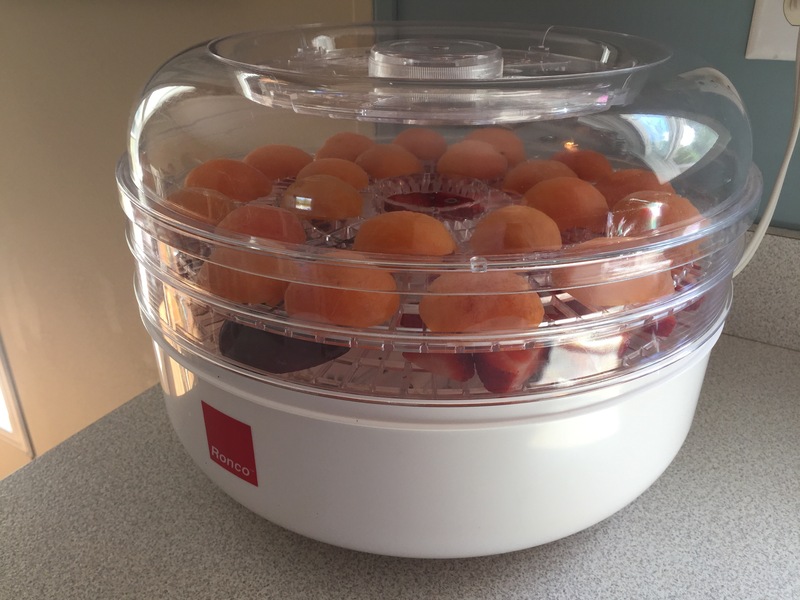 So many new possibilities for food preservation open up with this new tool. I brought it home and immediately loaded it up with a little of this and a little of that to experiment and see how different fruits came out. It has five trays so as I found more things I could try, I just added trays on top. The plum tomatoes came out nicely in just a day (think sundried tomatoes) and Mcgregor liked the strawberry chips. As I flipped through the booklet, I found a description of fruit roll ups and I knew I had to try that next. I had just bought a peck of peaches at the local fruit market in Kalkaska so I decided that would be my first flavor. 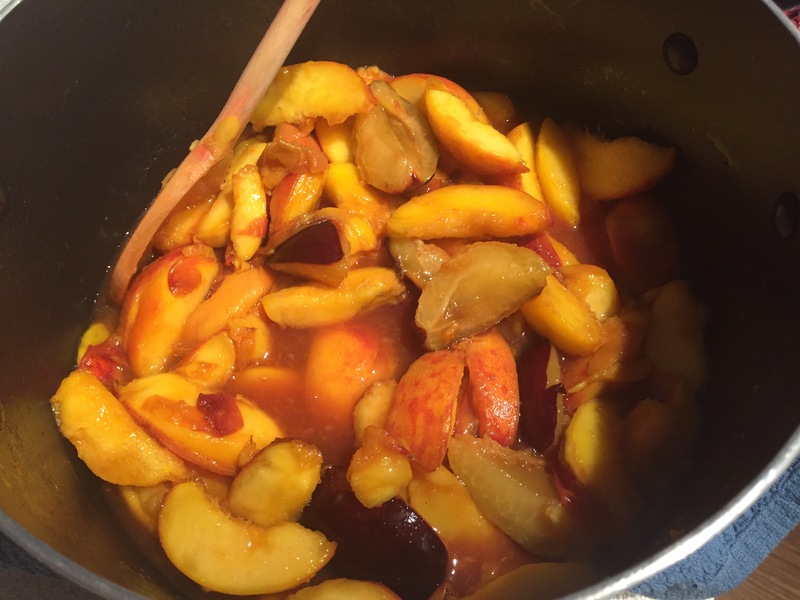 I pitted and cut up about ten small peaches and two plums. I added them to a large pot and heated them slightly. I stirred in a dash of vanilla and cinnamon as well as a 1/4 cup brown sugar and a splash of lemonade. They recommend juice but I didn’t have any so I used lemonade. I cooked it just long enough to soften the fruit and dissolve the sugar. 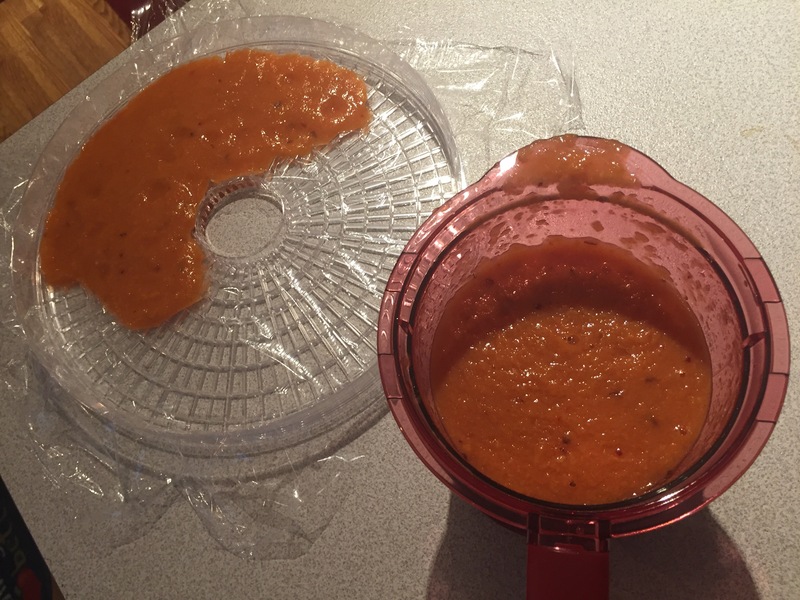 Next I scooped the fruit into a food processor using a slotted spoon, leaving much of the moisture in the pot. I puréed it until very smooth. 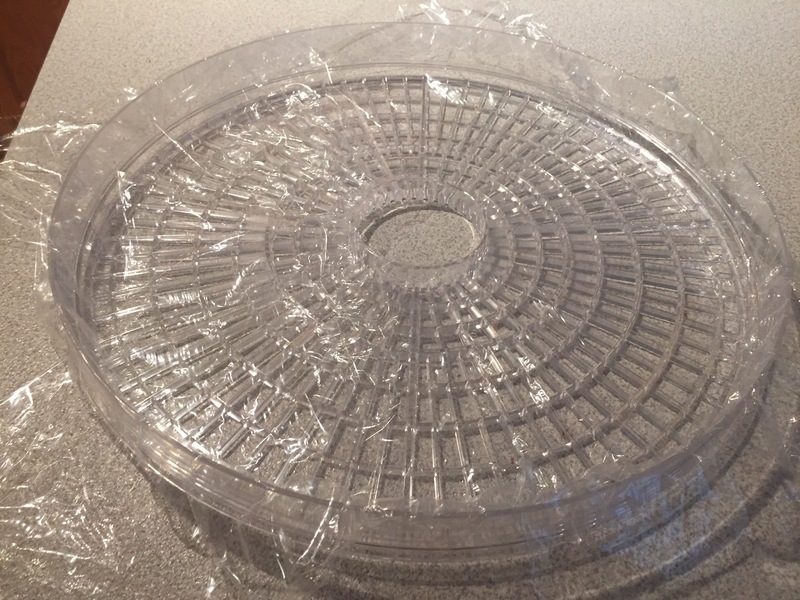 The trays for the dehydrator are slotted so you have to line them with plastic wrap, cutting out the center. 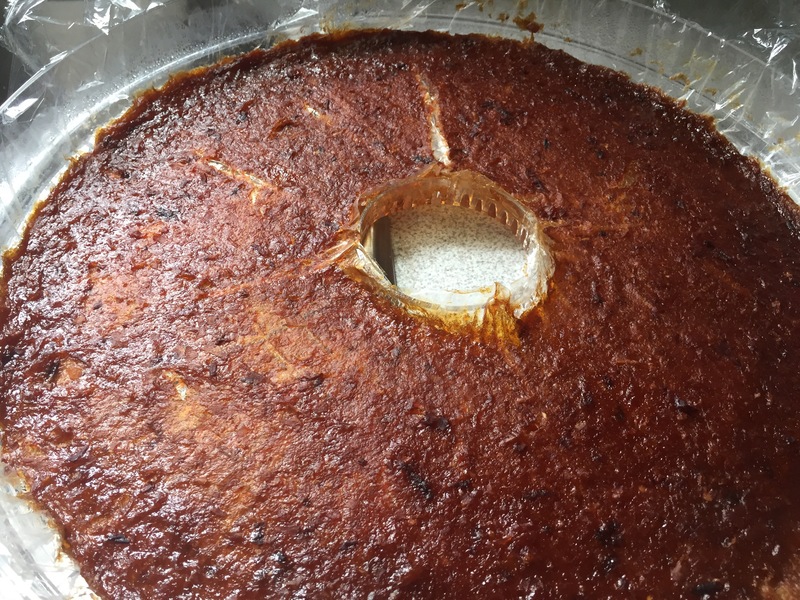 The first time I did this and began to pour in the mixture it came out around the middle. So lesson learned: when you cut out the middle, pull the plastic up to create a lip. 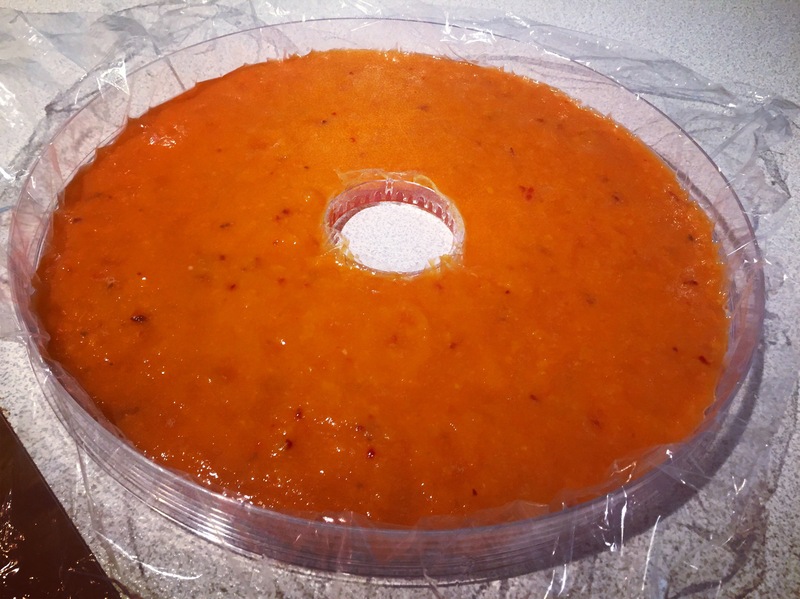 Now pour in the puréed fruit mixture, carefully spreading it out across the tray without disturbing the plastic wrap. This amount of fruit filled two trays about 1/4″ deep. My directions said for this model dehydrator not to do more than 3 trays at a time of fruit roll up. Next I loaded my filled trays onto the base and covered them. Every few hours I switched the trays back and forth since the one at the bottom dries faster, being closer to the heating element. About a day and a half later, I had two yummy looking treats to share with my boys! I pulled the plastic wrap out of the tray and carefully laid the fruit roll up side down on a piece of foil. 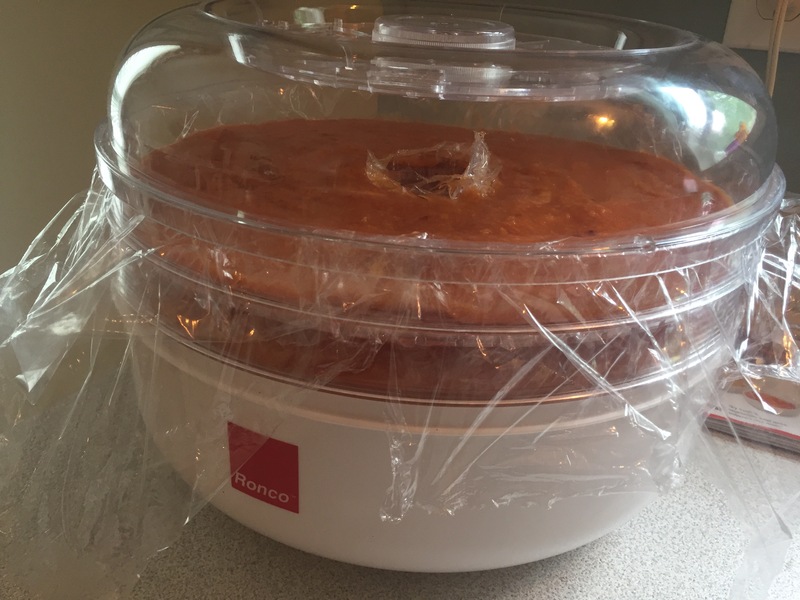 Then I peeled the plastic wrap off and put another piece of foil on the other side, making a fruit roll up sandwich. Finally, I gently rolled it up and stuck it in the fridge for an hour or so before we ate. This first batch was gone in minutes so I think I’ll probably be dehydrating a lot of fruit in the near future. Mcgregor even said he thought it was better than the stuff from the store – that’s a big complement from a mostly suburban preteen!